For those who may have missed it in a different context over at InterFaith21.com I had posted introductions to The Coastal Star newspaper and the Palm Beach Arts Paper. In print and online, both publications are packed with contributions by freelance colleagues such as yours truly who recently were with The Palm Beach Post or other area publications. The classy Star’s niche is coastal towns south of Palm Beach. Publisher Jerry Lower was director of photography for the South Florida Sun-Sentinel. Editor Mary Kate Leming, his wife, was media editor for The Post. Folks tell me they love the Star’s smart, locally focused content, the exquisite color photography on its high-quality paper. My InterFaith21 column is a regular there. I also contribute some political writing. Similarly, inserted In the Star through special arrangement is the Palm Beach Arts Paper — “Your Seasonal Guide to South Florida Culture.” Again, the arts writers and artists featured are my former colleagues Sharon McDaniel, Greg Stepanich, Scott Simmons, Hap Erstein, Katie Deits, Pat Crowley and others. Both publications are a great service for folks who constantly are telling us “I miss your” columns, articles, photos, artwork, etc. But they’re not only great reads — which is the feedback I hear. They’re also great media stories in themselves regarding the future of our newspapers. Stealing some of my lines written an Internet minute ago — “In this murky dawn of the digital age, as media-kind continue to stumble in search of ways to serve well and prosper” — I’m proud to say my Coastal Star and Palm Beach Arts Paper colleagues still are part of the answer. 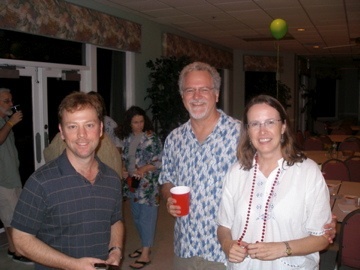 The editor of The Coastal Star, Mary Kate Leming, and Jerry Lower, her husband and The Coastal Star publisher, hosting area journalists in August 2008 in Briny Breezes. For those who may have missed it, in a different context over at InterFaith21.com I introduced The Coastal Star newspaper and the Palm Beach Arts Paper. The classy Star’s niche is coastal towns south of Palm Beach. Publisher Jerry Lower was director of photography for the South Florida Sun-Sentinel. Editor Mary Kate Leming, his wife, was media editor for The Post. Folks tell me they love the Star’s smart, locally focused content and exquisite color photography on its high-quality paper. My InterFaith21 column is a regular feature. I also contribute some political writing. Similarly, an insert in the Star through special arrangement is the Palm Beach Arts Paper — “Your Seasonal Guide to South Florida Culture.” Again, the writers and artists featured are my former colleagues: Sharon McDaniel, Greg Stepanich, Scott Simmons, Hap Erstein, Katie Deits, Pat Crowley and others. Both publications are a great service for our former readers who constantly are telling us “I miss your” columns, articles, photos, artwork, etc. Whether in print or online, the papers not only are great reads — which is the feedback I hear. They’re also great media stories in themselves. Particularly regarding the future of our newspapers. Recalling one of my lines from an Internet minute ago — “In this murky dawn of the digital age, as media-kind continue to stumble in search of ways to serve well and prosper” — I’m happy that my colleagues at The Coastal Star and Palm Beach Arts Paper still are part of the answer.